Treating Sprains and Strains thru R.I.C.E. Every year in just America alone people suffer millions of muscle sprains and strains. As common as muscle strains and sprains are, you would be amazed at the amount of people who do not know how to perform the beginning stages of treatment for muscle sprains and strains. Today we are going to discuss some basic rehab measures for your road to recovery. A simple little thing called R.I.C.E. treatment can go a long way to rehabbing muscles. A muscle sprain is when an injury occurs to a ligament. A ligament is tough fiborous tissue that connects two bones together. When you overstretch or tear this tissue a sprain is the result. A muscle strain is when a muscle or tendon is injured. A tendon is the tissue that connects muscle to the bone. Strains can vary in severity from simple overstretching to partial and complete tears of muscles. 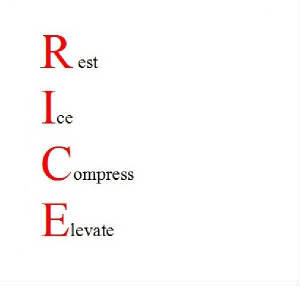 When a sprain or strain occurs it should be accompanied with R.I.C.E. treatment. R.I.C.E. is an acronym for Rest, Ice, Compress, and Elevate. If you do not know how bad your sprain or strain is be sure to consult your doctor first. The first 24-48 hours are considered the most critical after a sprain or strain occurs. Rest- for the first 24-48 hours all activities should be discontinued. Use the injured body part as little as possible and try to avoid activities that might cause pain to the injured area. Ice- For the first two days, ice the injured area as much as possible. Try to ice it every 3-4 hours for 20 minutes at a time. Compress- Compress the injured area when you are elevating it. Use and ace bandage or tightly wrapped towel. Make sure to wrap the area tightly but do not cut off the circulation to the area. Elevate- Elevation is also key. Try to elevate the injured area as best as possible. Try to get the area elevated as high as possible. If possible try to get the injured area higher than your heart. Pillows make great tools to help with elevation.